Road Transport and Bridges Minister Obaidul Quader yesterday said the bill for the new road transport law will be tabled in the Parliament on Sunday. "As the minister, I will present the bill in parliament on September 16. 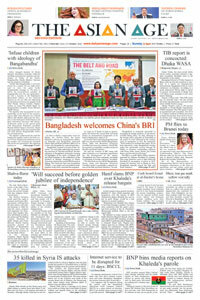 Later, the proposed act will be sent to a parliamentary standing committee," he told journalists after a meeting of the Dhaka Road Transport Coordination Authority. The bill will be passed in the last session of the tenth parliament after the standing committee clears it, he added. Quader, also the general secretary of Awami League, said one more session will be held after the current parliament session. "The ministers will do only their routine works after the declaration of the election schedule and there will be no responsibility of the lawmakers," he added. He said, "The next parliament elections of the country will be held like in other democratic countries. There is no scope of going beyond the constitution." Quader said Awami League will give a befitting reply along with the countrymen if BNP tries to create violence centering the upcoming national polls. He said, "We will welcome any non-violent movement of BNP and will face it politically…If they want to create anarchy in the name of movement, then we will prevent it along with the common people."